On my way back from the gym last night I was craving food that was fresh, and healthy. Bored with the usual food scene on the Main Line, I decided to stop at Firinji. What I ordered was tasty and really hit the spot. I started with a small fresh green salad topped with feta cheese, olives, a lite dressing and grilled bread on the side. Next was a red lentil soup. I liked that the base was made with a puree’ of lentils–no added heavy cream. 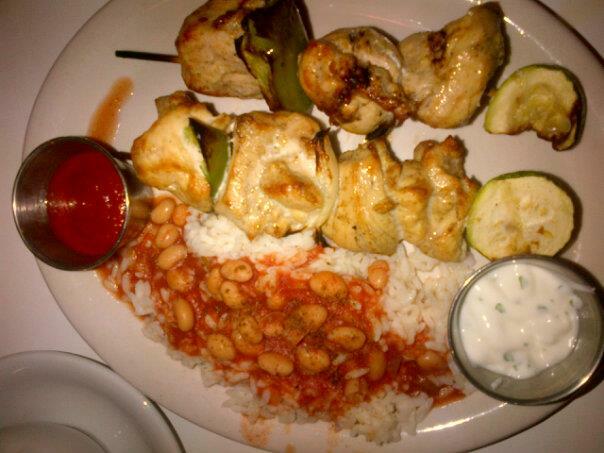 Finally, chicken kabob with a side of rice and beans in a tomato-base sauce, and grilled veggies! The chicken was tender, moist and flavorful. It was served with two condiment sauces, a mild yogurt and spicy red. I am not clear on how exactly how the food was seasoned, but it was beyond delicious. The owner (Budo) is a really wonderful guy. Like me, he enjoys talking about food, and we chatted about his past. He originates from Turkey, is a St Joe’s graduate, and has worked in some of the finest restaurants in the country. It shows in the preparation of the food and excellent customer service he delivers. He is a father of two adorable little boys under age 5, who happened to stop by with his wife. They seemed quite comfortable hanging out for a bit, so I think it is safe to say that this place is definitely kid-friendly!